BROOKLYN, N.Y., Dec 18, 2017 (SEND2PRESS NEWSWIRE) — A number of personal best performances marked an exceptional early start to the indoor track season as East Coast athletes from Boston to Virginia competed in one of the largest opening preliminary meets of the 44th annual Colgate Women’s Games. Three time returning champion Iantha Wright of Queen’s Jamaica High School won the 55M in 7.14; Last year’s Mid School champion Brianna Brown now a freshman at Dewitt Clinton High School, Bronx won the 200M in 25.99; Sophia Myers of Queens HS won the 55MH in 8.19, and Athing Mu of Trenton HS, NJ returning after a perfect season of double wins, took the 800M in 2:20.86, and the1500M in 4:55.69. Brooklyn’s My’Khiyah Williams, who holds High Jump records in Elem. B (4-feet 9-inches) and Mid School (5-feet 6.5-inches), cleared the bar at 5-feet 4-inches; and Manhattan’s Mariam Cisse of Promise Academy won the shot put with her personal best toss, 10.93M. Jasmine Douglas-Grant of Stroudsburg High School, PA, off a second place finish last season, scored her first major meet’s 1st place win in the 400M in 1:01.30. On Saturday, national sprint sensation Avery Lewis with four concurrent sprint records since first grade, moved up to the Mid School division and scored another double win with two personal bests; 7.16 in the 55M, and 25.56 in the 200M. The 11-year-old six grader (who turns twelve this week), attends Westtown School in PA, and has been called one of the fastest girls in the nation every year since her 7th birthday. Lewis holds Colgate Women’s Games’ Elementary A Records in the 55M (7.75) and the 200M (28.09); and Elementary B records in the 55M (7.35) and the 200M (25.99). Meet Director Cheryl Toussaint calls Avery Lewis a truly gifted young athlete and says competitors like her and many others through the years continue to make the Colgate Women’s Games among the nation’s premiere proving grounds for track and field talent. The Games have produced hundreds of national champions, and with last summer’s six alumnae on Olympic Team USA, 26 former Olympians, and in four decades, countless changed lives. With more personal records in the Mid School division; Peyton Rollins of Andrews MS in Medford, MA won the 55MH in an impressive 8.28; Rowan Houston of Rye Country Day in White Plains NY and Selah Dungey of St. Peter Academy, River Edge, NJ both cleared 5-feet 0-inches in the High Jump; and Melissa Aymil of Mendham MS in Brookside, NJ tossed 10.58 in the Shot Put. Also in Mid School on Saturday, Simone Kelley of Wissahickon MS in Ambler, PA won the 400M in 59.49; Returning division champion Alina LaForest of Drexel Neumann Acadamey won the 800M in 2:19.02; and Brooklyn’s Rainn Sheppard of Dock Street School won the 1500M in 4:55.13. Additional results for Saturday’s College/Open, and Sunday’s Elementary A and B and 30’s Plus division events are available at colgategames.com/results. Participation in the Colgate Women’s Games is completely free. Girls and young women compete within their own age/grade division for ribbons, medals and points. Events include 55 meters, 55-meter hurdles, 200 meters, 400 Meters, 800 meters, 1500 meters, high jump and shot put. Four preliminary meets and a semi-finals at Pratt Institute will determine who will compete at the finals at the New Balance Track and Field Center at The Armory, New York on Saturday, February 10, 2018, where trophies and educational grants-in-aid from Colgate-Palmolive Company are awarded to top place finishers in each division. Athletes, parents and coaches can follow scores throughout the series and find more information about the program at http://www.colgategames.com/. (1) National sprint sensation Avery Lewis with four concurrent sprint records since first grade, moved up to the Mid School division and scored another double win with two personal bests; 7.16 in the 55M, and 25.56 in the 200M at the opening preliminary meet of the Colgate Women’s Games in Brooklyn, NY on Saturday. 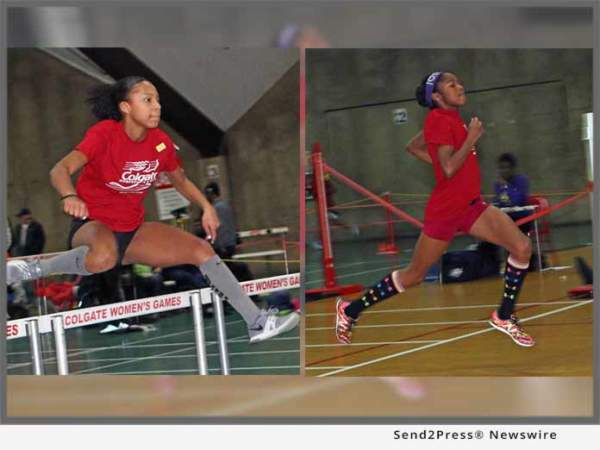 (2) Peyton Rollins of Andrews Middle School in Medford, MA won the 55MH in an impressive 8.28 at the Opening Preliminary meet of the Colgate Women’s Games at Pratt Institute in Brooklyn, NY on Saturday.